The following edge profiles are called ‘rabbetted’ lips where the door sits partially in the frame and partially on it. These profiles cannot be bored for concealed hinges. 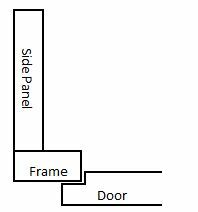 When ordered with cabinets, the overlay selected MUST be 1/4″ (an unpublished overlay. Let a Cabinet Joint professional know of your desire for this overlay and we can counsel you on it).